Conker Creative Lead Developing For Nintendo Console Again? 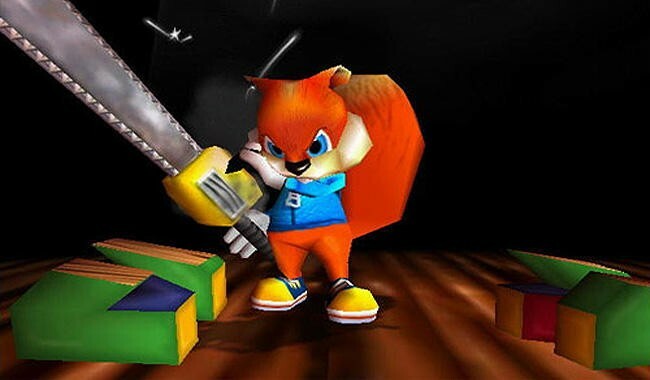 Conker's Bad Fur Day game director Christopher Seavor and his new development team Gory Detail could be creating a new game for the Nintendo Wii. Seavor took to his Twitter account to tease fans that he was working on a new Wii U project, and fans of his fouled-mouthed Nintendo 64 classic are hoping for a spiritual follow-up. …..WiiU devkits ain't cheap and it's lookin likely @GoryDetail is gonna need 3 at some point this year  (that's top secret btw) heh! A longtime worker at Rare Ltd. dating way back into the 1990's, Seavor was let go after providing voice work in Grabbed by the Ghoulies. He currently focuses on iOS games, but if this project pans out, it will be the first time in over a decade a game of his appears on a Nintendo console. For those who weren't around when it was first released, Conker's Bad Fur Day was a late Nintendo 64 platformer which gained notoriety after looking like a family friendly Rare platformer on the surface. Of course, it didn't take long for the game to unveil its true roots and prove to be one of the raunchiest games on the console. How far would a character like the Great Mighty Poo make it in today's hard and gritty video game world? Would the Call of Duty crowd be able to get the joke?